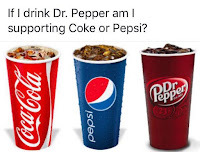 What Flavor Politician Are You? I found this image on the Being Libertarian page on Facebook. I have to wonder at naming a page Being Libertarian when it’s been demonstrated that Being Liberal was a thing on Facebook before there was a page called Being Libertarian, but I digress. The image is attempting to show how silly it is to say that Libertarians are Democrats or Republicans. Stealing votes from Democrats or Republicans. However, there is a problem in their logic, which I will illustrate literally. Gary Johnson is Crystal Pepsi, not Dr. Pepper. If it means anything, the Orange Hate-Monkey is Pepsi laced with arsenic. Clinton is not Coke, but then neither is Coke these days. Lacking access to a Coke (to take the metaphor to its proper conclusion) I’ll vote for the thing that says it’s a Coke. At least the can is the right color and the drink will be carbonated and not too sweet. 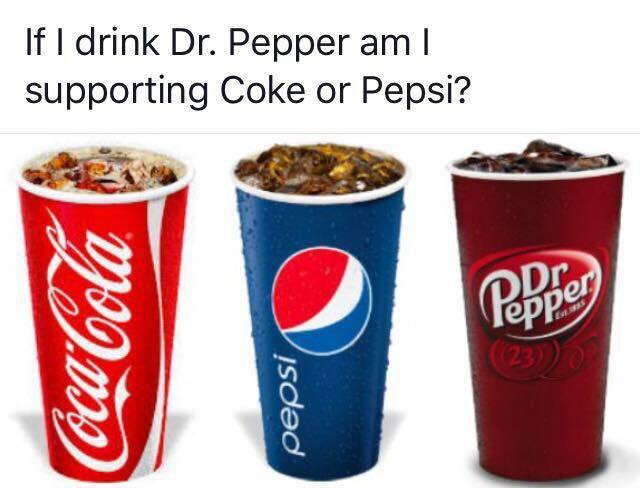 I don’t like Dr. Pepper anyway. Just in case that isn’t clear enough, I will elaborate further. Gary Johnson and much of the Libertarian Party (LP) philosophy and platform is Republican. I know they insist they are different, but in reality the GOP morphed into a variation of the LP about the time Reagan was President. They’ve been becoming more and more the LP as the Tea Party took over with each succeeding election since that time. So there are still only two flavors to choose from. That is by design. The system only works the way we see it working, unless we take the effort and energy to alter it’s framework. In a system where winners are decided by earning at least 1/N of the vote, there will be N choices. As I’ve said many times, I’m voting for Clinton. I prefer centrism. I prefer we not wreck the system. I prefer we reduce suffering rather than increase it. So I won’t dilute the vote by shifting my vote to some other candidate which has no chance of beating the two major parties who have hardwired themselves into the system. Facebook status and consequent comments incorporated and backdated to the blog.